Bat Presentations by Dr. Austin (The Bat Doctor) Featured in the Spring 2010 Issue of BATS magazine. Dr. Todd Austin (a.k.a. "The Bat Doctor") was recently featured in the Spring 2010 issue of 'BATS' magazine. Austin has been a bat conservationist since 1990 and has been entertaining audiences about bats throughout the state of Illinois since 1996. July 19, 2010 - PRLog -- Dr. Todd Austin (a.k.a. "The Bat Doctor") was recently featured in Spring 2010 issue of 'BATS' magazine. Austin has been involved with bat conservation since 1990 and has been lecturing about bats professionally throughout the state of Illinois since 1996. In this fashion, "the Bat Doctor" has educated over 3,000 people of all ages about these fascinating flying critters. 'BATS' is an international publication devoted to bat conservation and education. It is published by Bat Conservation International. Austin's bat presentation work was just featured in BATS magazine for the third time, although both previous mentions were smaller. The most recent article entitled “The Bat Doc” received a full page in the Spring 2010 issue of 'BATS'. Robert Locke, editor of BATS magazine, felt that interviewing Austin and featuring "The Bat Doctor's" bat outreach efforts would be a good way to spur on other bat enthusiasts and bat conservationists to get out there in the trenches and start giving bat talks as well. The photo that accompanies the full page article shows Dr. Austin (after a February 2010 bat presentation) with five Virden, IL 2nd grade students including his oldest daughter. The complete article and photo can be found on the internet at "The Bat Doctor" blog, which is located at: http://thebatdoctor.blogspot.com . 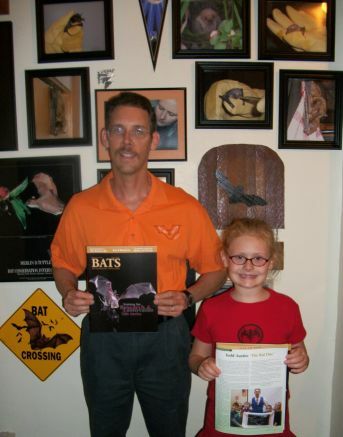 Photo caption: “The Bat Doctor”, Dr. Todd Austin and his oldest daughter stand in front of his 'wall of bats' while displaying the Spring 2010 issue of ‘BATS’ magazine, an international publication which featured a full page article about Austin’s bat outreach efforts. The Bat Doctor's oldest daughter and four other Virden, IL 2nd grade students were in the photo that accompanied the article. I'm an avid bat conservationist, who has been studying bats and their behavior for 2 decades. I've also been professionally speaking about bats since 1996. I've been featured in BATS magazine, an international publication (by BCI) on three occasions, with the most recent being the Spring 2010 issue. The Bat Doctor Celebrated Earth Day by Educating over 1,000 Youngsters about BATS during MAY 2013! Virden's Bat Doctor entertains Virden Elementary students about BATS! The Bat Doctor educates Girard Elementary School students about Bats! The Bat Doctor Gives Two Presentations and Attends a Research Symposium.